The arbitration indicator displays the Bid price of the current and all brokers connected to it from different providers of MT4 and MT5 quotes. It is in addition to the adviser Latency Arbitrage MT4 . The indicator can simultaneously display up to 5 connected quotes, and is compatible with MT5 versions. Data exchange takes place using a file. 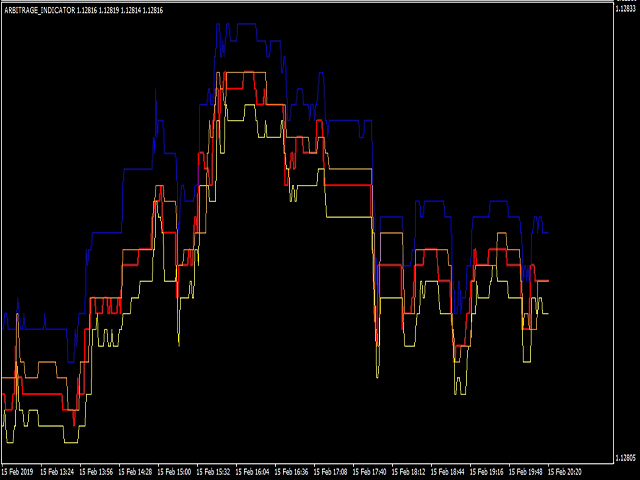 MT5 version of the indicator Latency Arbitrage Indicator MT5. The indicator can be used to find a fast / slow supplier of MT4 / MT5 quotations. The indicator is installed simultaneously on several terminals on the same computer. To receive quotes from the MT4 or MT5 version of the terminal, you must: specify the number of the connected trading account in the ACCOUNT_NUMBER field. A terminal with a connected trading account must be active and must have this indicator installed on it. If you did everything correctly, the indicator will start displaying the Bid prices of the current and all brokers connected to it. Quotes are displayed by the symbol on which the indicator is installed. In some cases, the indicator needs manual data calibration when the Bid price of the connected broker is higher or lower than the current price by several pips. To do this, in a quiet market when the price does not make sudden movements for 5-10 seconds, adjust the parameter BID_CORRECTION. If the price of the connected broker is higher, then set the values with the "-" sign and in 1 pip increments, and if the price is lower, then the "-" sign is not necessary. Calibration is carried out in the terminal which accepts quotes from other brokers. BID_CORRECTION - calibration of the Bid price of the connected broker, specified in pips.